Refrigerator filters offer superior taste compared to city tap water. Unlike tap water, refrigerator filters water comes out refreshingly cool. If you are purchasing bottled water, replacement water filters for your refrigerator are a fraction of the cost of purchasing endless amounts of bottled water. Filtered water helps you save money and save the environment. While plastic bottles can be recycled, not all the the material used to manufacture them is recyclable, so some still ends up in landfills. Discount Filter Store offers two different types of Daewoo refrigerator water filters to fit your needs. With a high quality filter, you can eliminate unpleasant chlorine taste and odor from your drinking water and ice cubes. 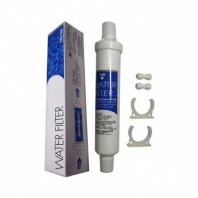 These filters are meant to be quickly attached using Â¼ inch plastic tubing, fixing clips and cable ties. Using an activated carbon block as their primary filter medium, these filters will last for about 6 months or 500 gallons. If you are looking for a different water filtration product, Discount Filter Store also offers products from leading brands like Sub-Zero, Water Factory Systems and Samsung.